The doomsday scenario hit Fox Sports on Tuesday night during Game 1 of the World Series between the Mets and Royals. In the middle of the broadcast, power apparently went out to the Fox broadcast truck at the ballpark, causing the broadcast to be interrupted due to technical difficulties. Fox then had to kick it to Fox Sports Live anchor Dan O’Toole in the Los Angeles studio with Eric Karros and Dontrelle Willis. If that wasn’t bad enough, it wasn’t just the broadcast that was affected – it was the actual game itself! When viewers finally got back to Kansas City, they saw Joe Torre on the field in a surreal moment that was reminiscent of the Super Bowl blackout in New Orleans a few years ago. Fox’s Ken Rosenthal reported that the delay was due to the inability to use the replay review system in New York. Thank goodness his smartphone was fully charged before the game. With network down, game delayed because of inability to review replays in New York. Evidently both teams agreed to go without replay for now. Trying to find out more. Both Fox and Google Fiber apologized for the power outage although Google’s outage is believed to be a separate issue. 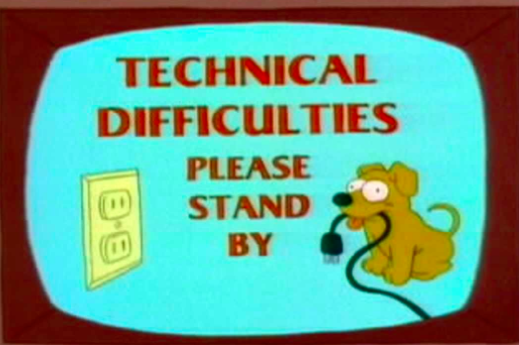 We apologize for technical difficulties with our #WorldSeries broadcast. We're so sorry about the outage in KC. We know it couldn't have happened at a worse time, and we're working as quickly as we can to fix it. Thankfully, Fox viewers were able to continue watching the game when it got back underway thanks to a simulcast of the MLB international feed called by Matt Vasgersian and John Smoltz. Fox thought they had remedied their difficulties, only to go back to the the MLB international feed. Quite awkwardly, in the bottom of the 5th inning, the Fox broadcast team of Joe Buck, Harold Reynolds, and Tom Verducci seemingly replaced Vasgersian and Smoltz, still seemingly on the MLB international feed. The normal Fox feed returned in the bottom of the 6th inning, making this quite an elongated broadcasting crisis. It’s obvious what happened here – Tim McCarver pulled the plug, didn’t he?